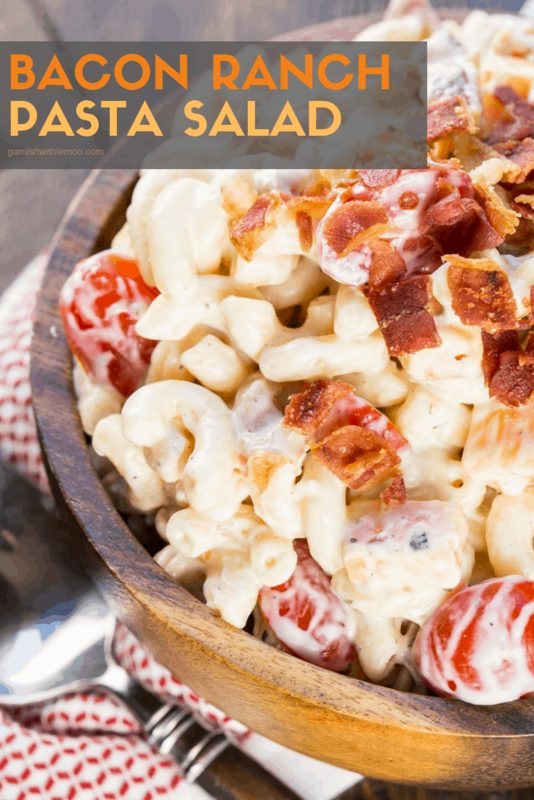 This Bacon Ranch Pasta Salad recipe is great for feeding a group! Who can say no to a make-ahead salad filled with bacon, tomatoes, cheese and a creamy ranch dressing? Summer is all about keeping things easy in our house, especially when entertaining a group. 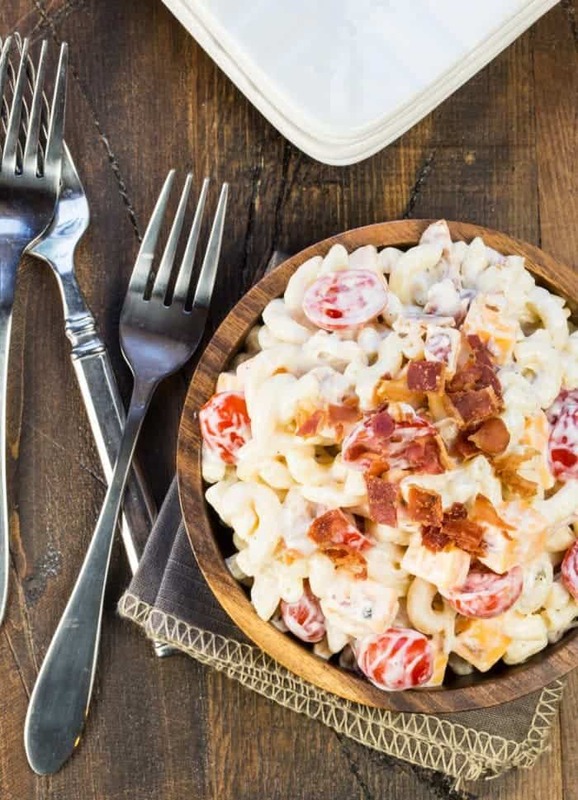 We love to have casual get-togethers, and this Bacon Ranch Pasta Salad recipe is a great make-ahead salad that easily feeds a group. My mom turned me onto this recipe when she brought it to a bbq we hosted at our house. It was an instant hit with everyone and once you take a bite, it’s easy to see why. 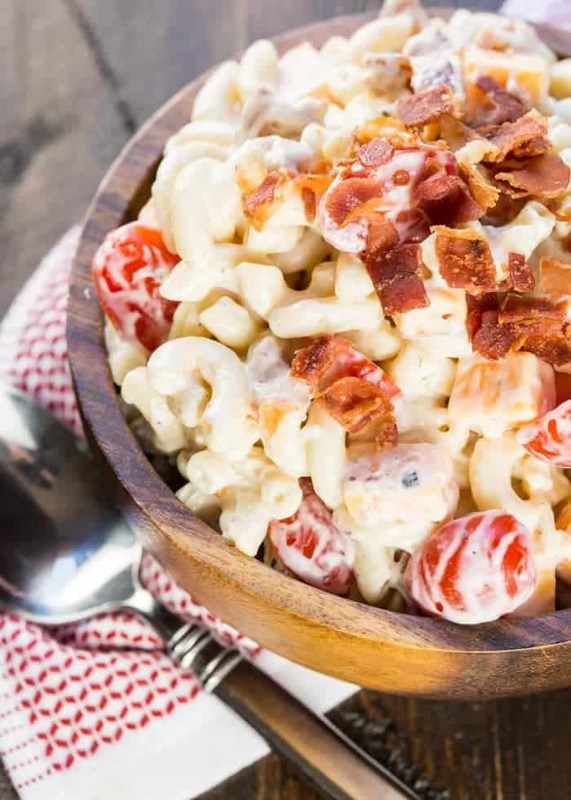 Bacon, cheese tomatoes and pasta all in a creamy ranch dressing. How can you go wrong? Not only is it make ahead, but this Bacon Ranch Pasta Salad tastes even better the next day. Things don’t need to be complicated when you are hosting. I always look for recipes that don’t keep me in the kitchen when friends and family are here. I try to have everything done before people arrive so I can to enjoy the night with everyone else. The versatile ingredients in this salad make a great companion to any protein. We like to serve it with these Hoisin Grilled Ribs and a simple green salad. Make sure you let us sit for at least 8 hours to let the flavors develop. Precooked bacon makes prep super easy and saves on clean up. Be sure to stir the salad well before serving. Add a little milk or buttermilk if it seems dry. Whisk together ranch dressing and buttermilk. Stir in the mayonnaise and vinegar and set aside. Cook pasta according to package directions. Drain and run water over to cool slightly. Place pasta, tomatoes, cheese and bacon into a large bowl. Add the dressing and stir well. Cool at least 8 hours or overnight. You may need to add a small amount of milk before serving if salad seems dry.